TORONTO – Three sentences, 75 words, one email. Those are the numbers behind a management’s discussion and analysis (MD&A) that ultimately led to another, more dismal set of numbers: $300 million in market value lost, a 55 per cent plummet in share price, a class-action lawsuit that named two Chartered Professional Accountants, and a recent agreement by Home Capital Group to pay a total of $30.5 million to the Ontario Securities Commission (OSC) and to settle a class-action lawsuit. The Home Capital saga should be of interest to every CPA across Canada, as it was driven largely by the wording of a commonplace communications tool of the accounting and finance profession, a core element of external reporting. The OSC alleged that Home Capital failed to satisfy continuous disclosure obligations, and made misleading or untrue statements in its 2014 Annual Report. In addition to cyber-crime, the Company is continuously exposed to other various types of fraud stemming from the nature of the Company’s business. For example, the Company must often rely on information provided by customers and other third parties in its decisions to enter into transactions such as extending credit. The recent increasing pace of advancement in available technology has increased the sophistication and complexity of potential fraud crimes to which the Company is exposed. How did 75 words in an MD&A lead to Home Capital’s downfall and a crisis of confidence in the Canadian real estate market? It’s June 2014 and the Greater Toronto Area is in the fourth year of a housing bubble. Alternative mortgage lender Home Capital — provider of subprime loans to the self-employed and people with poor credit histories or provable income — receives an anonymous letter sent to a member of the Home Capital board. Brokers are submitting “Accelerator” mortgage applications with falsified income documentation. “Instead of making $64,000, the person suddenly made $84,000,” HCG founder Gerald Soloway would later acknowledge. Blowes, who joined Home Capital as senior vice-president, finance in 2010 and was promoted to CFO in 2011 and executive vice-president in 2012, would retire at the end of 2014. Blowes was not named in the OSC statement of allegations. Morton assumed his new role on January 1, 2015. Positioned as a growth company, Home Capital’s success was fuelled in large part by the number of new mortgages originated (“originations”) in Ontario’s hot housing market. At the same time, however, mortgage fraud was on the rise. In 2017, Equifax Canada reported a 52 per cent increase in suspect mortgage applications between 2013 and 2016, two-thirds of which originated in Ontario. According to the OSC allegations, by February 2015, Project Trillium “confirmed that HCG was receiving fraudulent employment income documentation through its broker channels which had not been detected by HCG's underwriting controls.” The company cut ties with certain brokers and addressed “serious systemic underwriting control deficiencies” but it levelled Home Capital’s originations: the mortgage business dropped 32.5 per cent in one year and Accelerator volume targets were reduced by 50 per cent. Home Capital had long been the target of shortsellers, particularly outspoken American Marc Cohodes, who compared the Canadian real estate market to the American market prior to its collapse. He was among many investors who questioned the reasons behind the company’s flat results for Q3 2014 but could not discover why originations had suddenly flatlined. The company continued its misleading disclosure through its Q1 2015 interim filing on May 6, 2015 and its May 7, 2015 earnings call with investors. One year later, CEO Soloway steps down from the company he founded. In March 2017, the OSC sends enforcement notices to the company, and releases its formal statement of allegations in April. Morton is moved to another role and Blowes returns as interim CFO. In February 2017, Canada’s leading class-action law firm, Siskinds LLP, launches a lawsuit on behalf of Home Capital investors. The firm is well-known for its record of securities class actions, which include Sino-Forest, Manulife, SNC-Lavalin, and Valeant Pharmaceuticals. Its Home Capital class-action lawsuit names executives Soloway, Morton and Blowes. It’s worth noting, however, that Home Capital was prepared to vigorously defend its disclosure practices. As reported by Andrew Willis of the Globe and Mail, “many lawyers believe Home Capital and its executives would have been cleared if the OSC allegations had ever been taken to a hearing. It’s also worth noting the wording of the three sentences in question. The company was indeed “exposed to other various types of fraud,” as indicated by data reported by Equifax Canada. And it was, indeed, in the “nature” of Home Capital to rely on the integrity of mortgage brokers and their clients when selling Accelerator mortgages. If the failure of the company’s internal controls brought to mind this scene and this one from The Big Short, that could be dismissed as the overheated imagination of some sectors of the business press. The aftermath of the OSC allegations shook the markets and has been widely reported in the business press. A run on deposits. A bailout loan at “subprime” rates from the Healthcare of Ontario Pension Plan. The vaporization of capital. Real questions about the survival of the company. Then today's surprise buyout of 38.4 per cent of the company by Warren Buffett's Berkshire Hathaway. Just last week, Home Capital issued a press release announcing it had reached settlements with the OSC and “with respect to the putative class action commenced in February 2017 by Claire R. McDonald, Action No. 349/17CP (the "Class Action"),” subject to court approval. 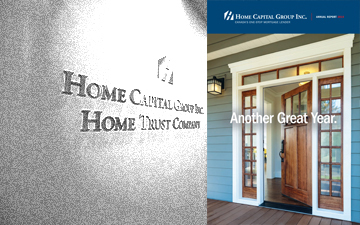 In its release, Brenda Eprile, Chair of the Home Capital Board, stated "Home Capital will accept full responsibility for failing to meet its disclosure obligations to the marketplace and appreciates the importance of the serious concerns raised by the Commission with respect to continuous and timely disclosure." Eprile continued, "The Company also acknowledges that the Commission is not to blame for the events of recent months involving its liquidity position."